StumbleUpon is a Social Network that helps to organize and find unique webpages that you might be interested in based on your interest. StumbleUpon also allows you to share your web page with other users within the network. It helps to find your targeted audiences or readers and drive them to your web page. StumbleUpon is a great tool to drive traffics to your website and every blogger should have an account with it. So, if you are interested in creating a StumbleUpon account and submitting a page to StumbleUpon, you may check the guides as follow. We'll be covering some general good practices to maximize traffics from StumbleUpon without violating the terms and getting your account banned. Launch your favorite browser and browse to https://www.stumbleupon.com/ . To register an account with StumbleUpon, you may use your existing Facebook or Google account. Click on Connect with Facebook or Connect with Google to proceed. 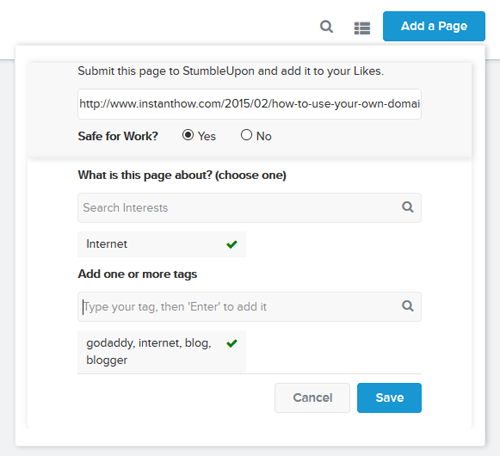 StumbleUpon will then ask you to select your area of interest. You'll need to select at least 10 interest to proceed. As mentioned above, StumbleUpon helps to find unique webpages that you might be interested in, these 10 interest that you've selected will serve as the matching criteria. To submit a page to StumbleUpon,click on the arrow down at the top-right. From the menu shown, click on My Profile. You should see add a page button at the top-right. Click on it to proceed. Add A New Page screen should appear and you'll need to fill out your page details. 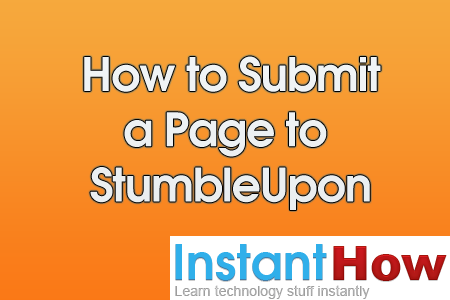 Click on Save after filling the details and you are done submitting a page to StumbleUpon. If your web page is safe to be browsed on a work-related computer or during working hour, select Yes. If no, please select No. 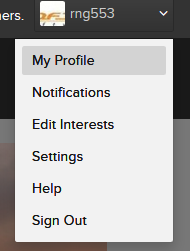 Click on the find icon and it will brings up a list of topics to choose from. This is the keywords or tags for your web page. These can help Stumblers find your web page based on the same keywords and tags. You can enter multiple keywords or tags separated with a comma. Avoid from submitting too many web pages on the same day. It makes it incredibly obvious you’re a spammer. StumbleUpon is a social network website, try make new friends and grow your network.